I have a problem that I would like to confess to. I am addicted to buying baby clothing. It's so bad that Adalyn probably has a different outfit to wear everyday of her life. Haha. I love shopping for deals and it is easy to find good deals on baby clothing. I shop clearance racks, use coupons, shop garage sales and shop a local Facebook mom swap site. Our favorite brand that we use most often is Carter's. We love the different designs and have found their clothing to be quality. 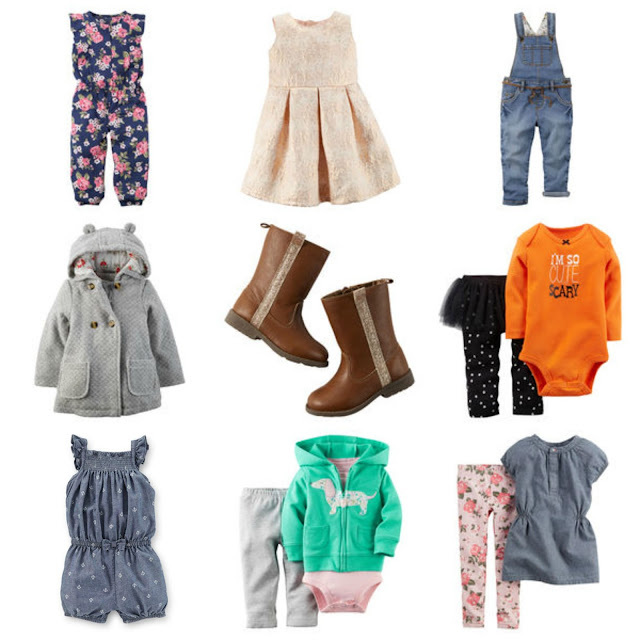 Carter's clothes are found in nearly every store so about 70% of Adalyn's clothes are Carter's. 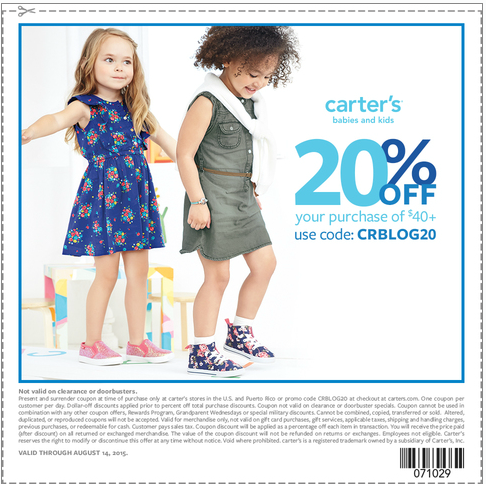 I recently went on a Carter's shopping spree at Birch Run which is a shopping outlet. I got her a bunch of clothes for next summer that are super cute. I couldn't help but notice all of the cute clothes that they had in store for fall. 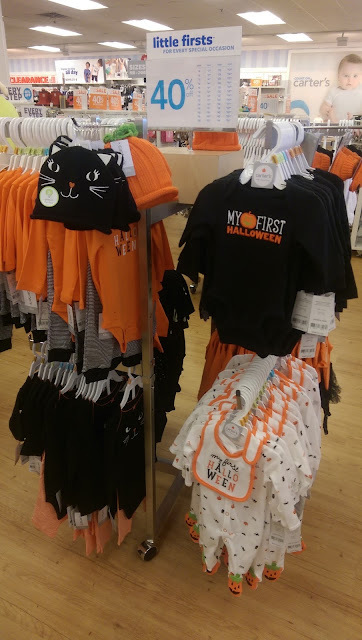 Halloween clothes, cute jackets, long-pants rompers and more. I bought Adalyn this cute cupcake outfit and a couple more pieces. Carter's is a very functional brand which I love. Adalyn can wear these pieces crawling around and taking steps and they still stay nice. The swimsuits are great and so are the little shoes. We are a Carter's loving family around here! The overalls! Perfect for fall. My #1 item is probably the floral romper- adorable! And of course the dachshund outfit has to make my list- we buy everything we see with a dachshund on it. The dress above would be perfect for Thanksgiving or Christmas. I have a skirt that matches that which would be great since I love being twins with Adalyn. 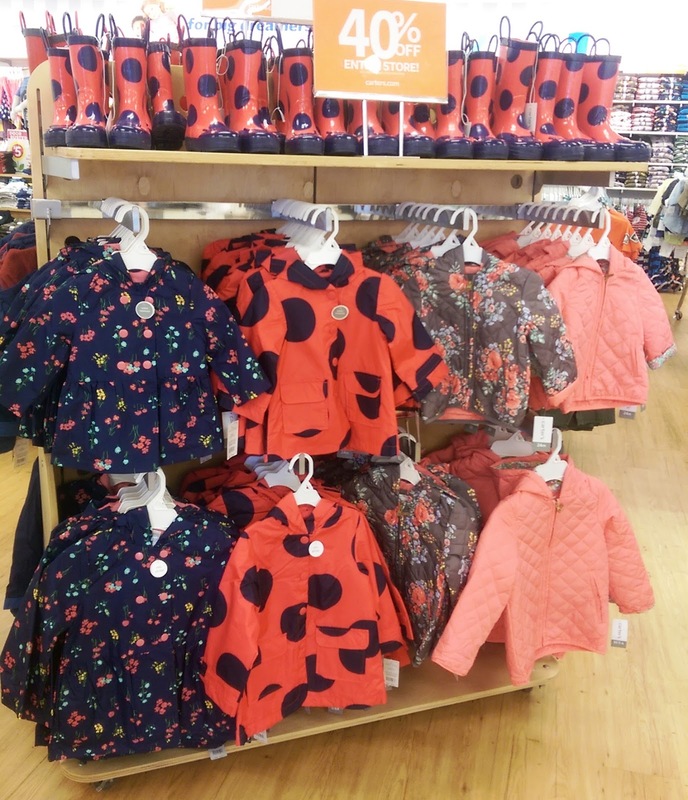 The Back to School, Fall 2015 Carter's collection is absolutely adorable! Everyone likes getting "back to school" clothes even if they are not going back to school (I know I do). I cannot believe how many cute items there are. I am of course having trouble not buying every single item that I see. Just look at these outfits for Halloween!